I am not sure if the word jammer is only a regional term, but when I talk about my tractor and jammer with people from other parts of the country, they have no idea what I am talking about (much less people from other parts of the world). In fact, even many people from right around here do not know what a jammer is. Just for the fun of it, I googled the word jammer. I learned that there is evidently some swimwear known as jammers, there is a type of keyboard called a jammer, and it is a device used for jamming radio signals (besides having several other definitions). However, in all of these definitions, there is no Northern Wisconsin jammer. Actually, this may not be so surprising, since a jammer is from the technology of my father’s generation. It is a technology that I still use. A Northern Wisconsin jammer is used for working in the woods. It is a winch and boom setup that is mounted to the back of a tractor or small caterpillar. Mine is mounted on a tractor. On my last blog post I told you that I consider myself a pretend farmer. Well, this winter I am also kind of pretend logger. These are things that I have missed while we were living overseas and I am having fun this year getting back into the life here, while hopefully making a little bit of an income. My tractor and jammer are part of it all. The operation is simple and basic, although a little dangerous. After felling the tree with a chainsaw and cutting the tree into eight foot lengths, I then pull the cable from the winch, walk out to each log, and hook it with the log tongs. I then walk back to the tractor to activate the winch, which is done by pulling on a rope. The winch is made out of an old brake drum from a pickup truck. It pulls the log in from where it is lying and then lifts it on to the trailer. There is still hard labor involved, but not the back-breaking labor of much earlier days. When my father was a young man, back in the middle part of the last century, every logger wanted a jammer. Even when I was growing up and myself a young man, the tractor and jammer was normal method of logging in our part of the country. No more. Today most woods workers use skidders, forwarders and processors. The latest innovation in logging technology is the processor. With the processor, the machine operator never leaves his seat in the heated cab. The machine grabs the standing tree with huge and powerful pincers while a saw emerges underneath and saws the tree at the stump. Then the pincers lays the whole tree down, feeds it through some knives to cut off the branches, and saws it into lengths. There is much that could be said on this subject, but it is not my purpose here to speak against technology. Nor is it is not my wish that everyone would use a tractor and jammer in the woods like I do. If they did, there would be some lumberjack logging with horses or oxen who would think that no one should be using those newfangled jammers. It seems to me that to speak against technological advances would be to deny the human spirit, which was, after all, created in the image of God. There is something within us that causes us to want to constantly improve things and find ways to make our lives better, whether it is better logging equipment or any other forms of technology. Unfortunately, this is not the end of the matter. When we, as a human race, rebelled against the Lordship of our Creator God, our natural inclination to do good turned to a natural inclination to evil. This is what I have referred to in other places as The Great Rebellion, and it has affected absolutely every aspect of our existence, including our use of technology. Some would say that technology is neutral, neither good nor bad. They would say that it all depends on how it is applied. I see that point, but I think a more realistic view is that technology, like everything else in our human nature, has been affected by the great rebellion. Technology is not exactly neutral, because if left to its own devices; it will naturally and eventually lead to destruction. Technology may have at one time been naturally beneficial, but as an effect of our rebellion against our God, it has fallen from its lofty position. Like our own spirits, it needs to be redeemed. Redeeming something involves bringing it back to its original purpose. This includes our natural desire at trying to improve and make our lives better. Without redemption, things that we do to try and make our lives better will eventually work against us. God has another plan. When God created man, we read that He put man in the Garden of Eden to “cultivate it and keep it” (Genesis 2:15). These are two words that indicate stewardship. They show that God’s purpose for giving us the ability and the desire to keep making improvements is for the care of His creation. When we use our skills to fulfill the mandate given to us by God, we find that we are also the beneficiaries. I like my tractor and jammer, but there is no virtue in using yesterday’s technology. The virtue comes from using the technology that we have to do the work of God. We are the gardeners of creation. This is Cora. Cora is due to freshen this month. For those of you who do not have a farm background, when we say that a cow is due to freshen, it means that she is pregnant and will soon have a calf. Just by looking at her, it may be a little difficult to tell that Cora is pregnant, since she is a Scottish Highlander. These cows have a natural form somewhat like an old, wooden stave barrel, except with legs and horns. They always look round and plump. As I have explained in the past, winters in Wisconsin can be quite brutal. So far this year it has not been so bad, but we are about to be hit with an especially cold blast of air out of Canada, with night-time temperatures falling to 20º Fahrenheit below 0 (about -29 Celsius). Our highlanders do not stay in a warm barn, but are out in an open paddock. I am hoping that Cora will not start calving during this extremely cold stretch of weather, which is to last about three days. Every day Cora comes up to the fence where I feed the cows a little grain and give them water. Every day I talk to Cora about her calf. Perhaps I should tell you that, although I like to call myself a farmer, I confess that I am not a real farmer. I am more like a pretend farmer. My cows are as much my pets as they are a source of income for me. So, as any person talks to their pets, I also talk to my cows. Every day I tell Cora to try and wait until the weather warms up a bit. It is hard to tell if she understands me at all, since that long hair of the highlanders hangs in front of her eyes and I can’t see what she might be thinking. Our conversation, as you can imagine, is all a bit one-sided, and since I have to supply all of the actual subject material for our talks, it has caused me to become a little off track. So when you see the abomination of desolation spoken of by the prophet Daniel, standing in the holy place (let the reader understand), then let those who are in Judea flee to the mountains. Let the one who is on the housetop not go down to take what is in his house, and let the one who is in the field not turn back to take his cloak. Now, I must admit that it is quite a digression to go from Cora’s predicament to some teachings of the last days of this present earth, but this is a portion of Scripture that I have thought about a lot. These words of Jesus are some of the most enigmatic that he spoke, and the precise timing of these events has been long contested among Bible students. Many teach that these are events that will happen after all believers in Christ have already been taken into the presence of God and thus, out of danger of all that is occurring on the earth at the time. I have even heard it said by some Bible teachers that this part of Scripture need not concern the Christian, since we will not be present on the earth. To me this seems a potentially dangerous teaching, especially since there are many reasons to suspect that some of the events spoken in relation to the end times are persecutions that are being waged against Christians who indeed are still on the earth. I frankly am convinced that the teaching of Biblical prophecy shows us that toward the end of the age, we will see increasingly severe persecutions against the true followers of Christ. What the Bible calls the antichrist will be in power and have great influence in the world for some significant period before it becomes evident who he really is. The possibility is very real that many believers in Jesus will be persecuted by those under the antichrist’s control. The long awaited time when God will “catch up” his people into heaven will come before God begins to show his wrath against the government of the antichrist, but not before many followers of Christ will have already suffered many forms of harassment from the antichrist. (My full view of the prophecies of the last days of the present earth can be found in my book, Watching for the Day). I am not one who construes every government decision that runs contrary to Biblical teaching as persecution against the followers of Christ, but it seems evident to me that week by week we are seeing an increasing tendency to solve the problems that confront us using the wisdom of man, and not the wisdom of God. Also, among the people of the world, the teachings of Jesus are being twisted and distorted so that they are completely misrepresented. Nor am I trying to be a scare-monger, but those of us who follow Christ must walk with wisdom in these days, living in obedience to our Savior. All of us have been given our own sphere of influence, whether it be in our own families, our schools or workplaces, our churches, or even in some larger arena. Whatever it may be, we must be faithful in fulfilling our ministries, and trust God for the strength and endurance to confront whatever is to come. I’m talking about the “F” word. If you are a native English speaker, you know the one that I mean. Usually you do not see it spelled out but instead with asterisks (*) in place of letters. Some people try to get real cute and put various symbols that have a vague resemblance to the letters that they are replacing. I think that people who use this word in their speech or in their writing believe that it demonstrates that they are tough and that you had better not mess with them. At least that has been my observation. I interpret it differently, however. To me is seems that they are unsure of themselves and they are compensating for their timidity by what they think makes them appear strong and independent. They are little children peaking out from behind their mothers and trying to act brave. Whatever the true reason, using this kind of speech ends up making life less enjoyable, as if we are being constantly challenged even in our everyday conversations. Oddly enough, the specifics of the interview came down to the “F” word, which was, at the time, not allowed in movie scripts. The movie producer said that it was his goal to see this word used in his movies, and this would be an indication of the loosening of censorship standards. This to me seemed a very strange and distasteful goal. As I listened to him talk, I wondered if he would like that as an epitaph on his headstone. "Here lies movie producer so and so. He achieved his life’s goal of having the “F” word used in movies." A lofty achievement, wouldn’t you say? Last night I had a dream in which I was looking for an envelope. With the new year of 2013, I needed a new envelope to keep the receipts and other papers that we were beginning to accumulate in our household already this year. In my dream, some of these papers were correspondence that I thought that I should keep. Several of these letters contained the "F" word in the correspondence, or other words that we consider swear words. Now, I want to be clear that in real life, we do not receive letters that are full of vulgarities from people, but in my dream, some of these were. I found an envelope in the back of our filing cabinet that I thought would work well for keeping letters for the new year. In that envelope I put the letters that had come so far in this month. When I pulled one of them back out to read it again, I discovered that all of the “F” words and other vulgarities had disappeared! I pulled out more! On every letter, all of the swearing had disappeared! One of the things that struck me in my dream was that nothing else had changed in the letters. The sentences were not re-written to accommodate the loss of some words. On the contrary, with the removal of these words, the sentence structure and syntax had actually improved! The vulgarities had served no purpose whatsoever in the sentences. As I re-read one of the letters, it was amazing to me how much more clearly the meaning and the intent of the letter came out. That was my strange dream, but a rather nice one. It just made life much more enjoyable! Hopefully, tonight I will dream about a magic hearing aid! Today, while working in the woods, I cut down a large soft maple tree. The tree had an open crack running up the side, so I knew that it would not live many years more. The wood inside was no doubt rotten, and the tree probably hollow. As the tree fell, I could see that indeed, it was hollow. It had a hole about four inches in diameter in the center, and I knew that in a soft maple, this hole would run up the trunk several feet. This tree was long overdue to be harvested. As I was cutting the tree into lengths, I noticed a small woods mouse running across the surface of the snow. Then, as the log I was cutting fell away from the rest of the tree, I saw in that small hole in the center of the tree, a little mouse nest. It had been made cozy by a soft filling from the down of wild turkeys that lived in the woods, and with plant fibers that the mouse had found near his tree. I looked for the mouse again. He was scurrying around on the snow, ducking into little holes in the snow he found under stones and old fallen branches. I wondered what this tiny evictee was going to do the rest of the winter. I had just cut down the home that he had carefully prepared in order to make it through our long and cold winters of Wisconsin. Now he was at the mercy of whatever snows and cold would be coming the rest of the year. There was no turkey down to find anymore, no soft plant fibers. It was all covered with snow. And what of his stored food? I assumed that was also someplace in that hole in the tree that I was soon to take out of the woods. I found myself feeling sorry for the little rodent. Realistically, I knew that leaving the cut log in the woods for him would not help. My chainsaw had destroyed his nest, and with the destruction of his home, he was now so disorientated that he would not find his food cache. I knew that in all probability, he would not make it through the winter. It would either be starvation for him, or a fox would catch him. I hoped that it would be the fox. It would be less cruel. But if so, although it would be a fox that would kill him, I knew that I was accessory to the crime. 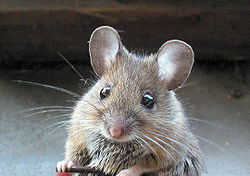 I was the one who had taken away the security of the woods mouse and had left him to the mercies of cruel nature. I have never considered myself an old softie. 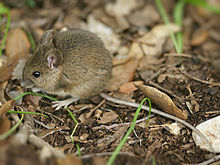 I know that this is far from the first woods mouse that I have left homeless in midwinter, and it will not be the last. Truth be told, this has always bothered me a little, but it seems to be getting worse with me. Perhaps I am turning into more of an old softie. But I think that it is more than that. I think that it is more to do with the fact that after living some six decades on this earth and seeing the daily struggle for life both among humans and in the rest of nature, I have grown tired of the existence of death. Why is it that our lives should be so surrounded by death? This hunting season I shot a deer. It was a good shot. The deer ran about three steps and fell down. Happy to have a successful hunt, I ran up to the deer, intending to cut its throat to let it bleed out. When I approached the deer, it lay there on its side, still alive. Its one eye stared up at me in terror. It could not breathe and it could not move. I had shot it through the lungs and it could get no air. As it lie there gasping for life, I did not have the heart to put the knife to the throat until I could put this poor animal out of its misery. I pointed the rifle barrel at the head and fired a shot that took away any terror the deer had felt. This was not the first deer that I have ever shot, so that was not the reason for my over sensitivity. My feelings are not feelings that a hunter is supposed to have. If you have ever seen a video of a pack of wolves taking down a deer, you know that these are not feelings that we find in nature. In nature it is predator vs. prey. There is no room for sympathy and no room for error. In my case, I know that it is just because I am getting weary of the existence of death. Why is it that for us to live, other creatures must die? I will never become comfortable with death. In fact, I increasingly despise it. I hate the fact that it is part of our existence here on earth. It was not always that way. In the beginning it was not. Without going into a long, theological explanation, death is a consequence that has come to us because of sin, and sin is nothing more than rebellion against our Creator. We, as humans, thought that we could order our lives better than God, so we rebelled against His sovereignty. One of the results is that today, in this age, the death of something or someone confronts us at almost every turn. This is why I will never be comfortable with death – any death. And this is why I await the new natural order when death will be finally and forever swallowed in the victory of life. Wolves will lie down with newborn calves, and little woods mice will run free. “Thanks be to God, who gives us the victory through our Lord Jesus Christ” (1 Corinthians 15:54-57 NAS).